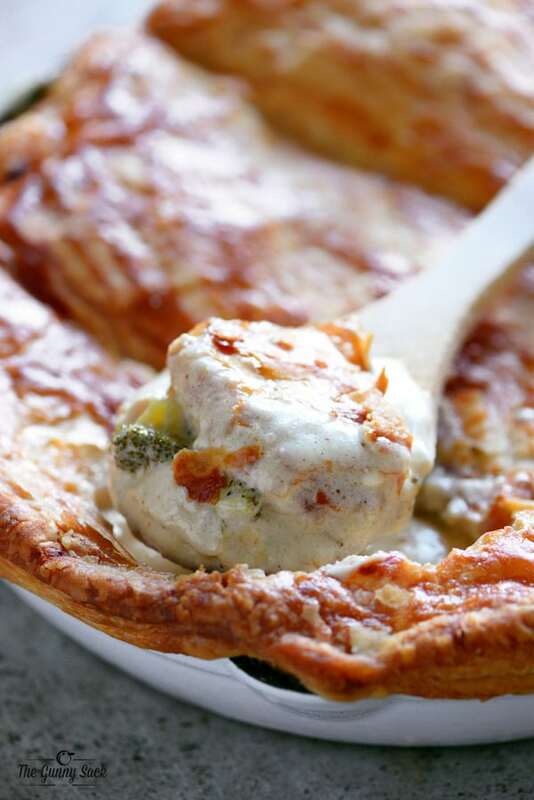 With cool, crisp fall in the air, warm, creamy comfort foods are perfect for family dinners. 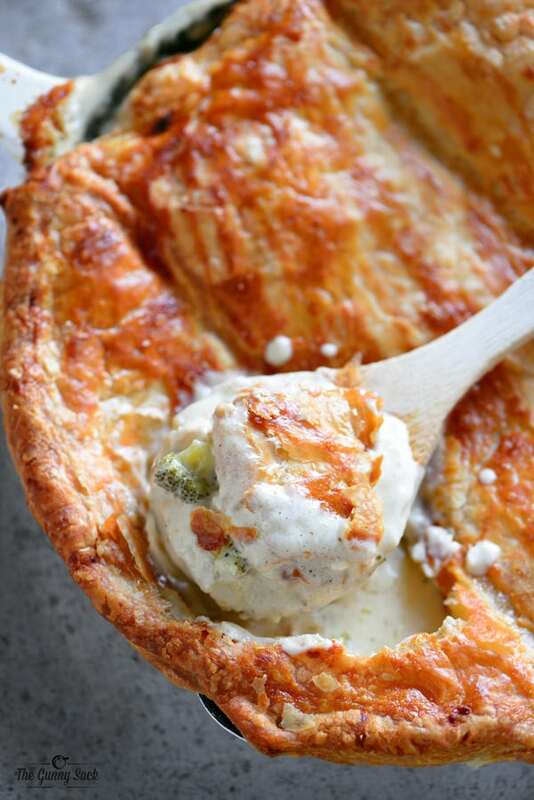 I started with the traditional chicken pot pie and then added alfredo sauce and a gorgeous puff pastry crust. This easy family dinner recipe can be customized to your family’s specifications by adding your favorite vegetables and removing ones you don’t want. Cut the chicken breasts into cubes and cook over medium-high heat for 5-6 minutes. Then, add diced potatoes and broccoli and continue cooking for 4-5 minutes. 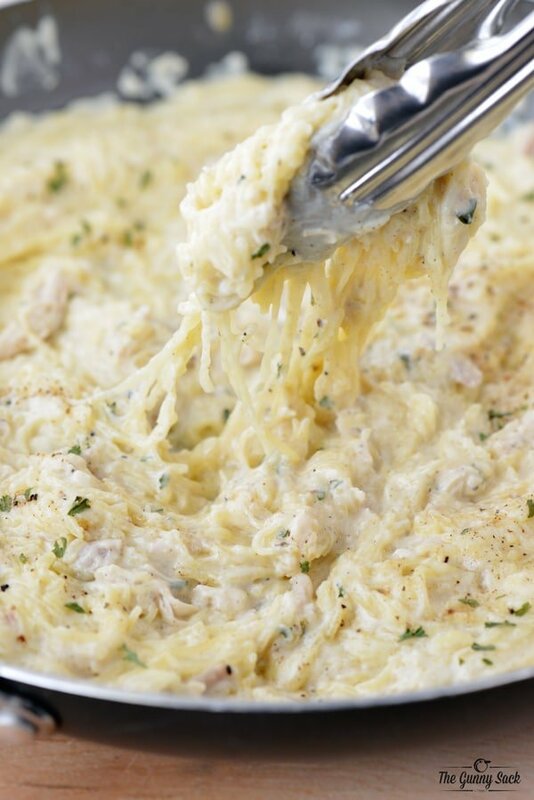 Add heavy cream, shredded parmesan cheese, cream cheese, butter, minced garlic, black pepper, and salt. 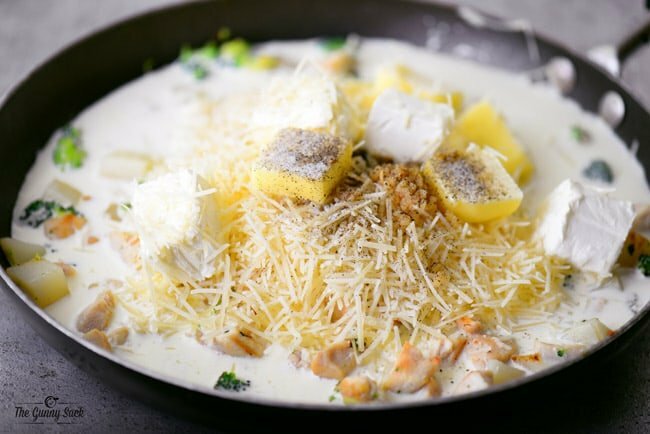 Stir and cook over medium heat until the ingredients are combined and the cheese is melted. 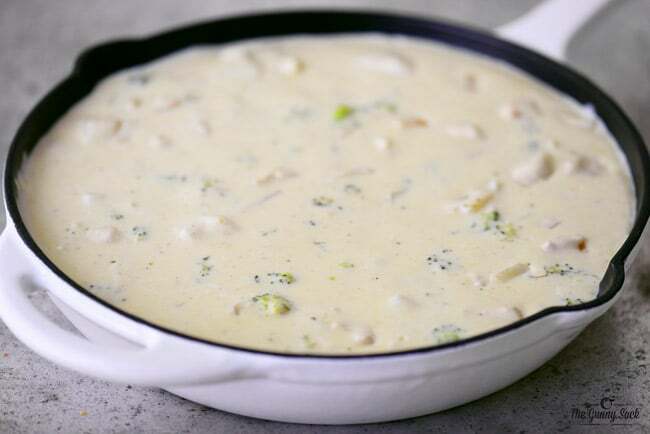 Pour into a greased 10-inch cast-iron skillet or baking dish. 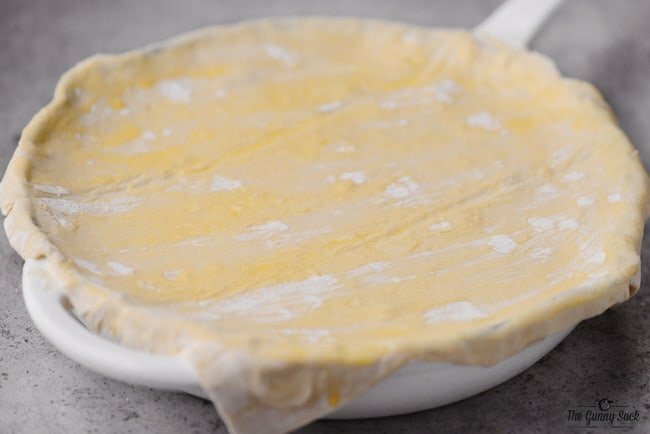 Cover with a sheet of thawed puff pastry and brush with a beaten egg. Place the pan on a rimmed cooking sheet to catch spills. Bake at 400 degrees for 25-30 minutes, until golden brown. 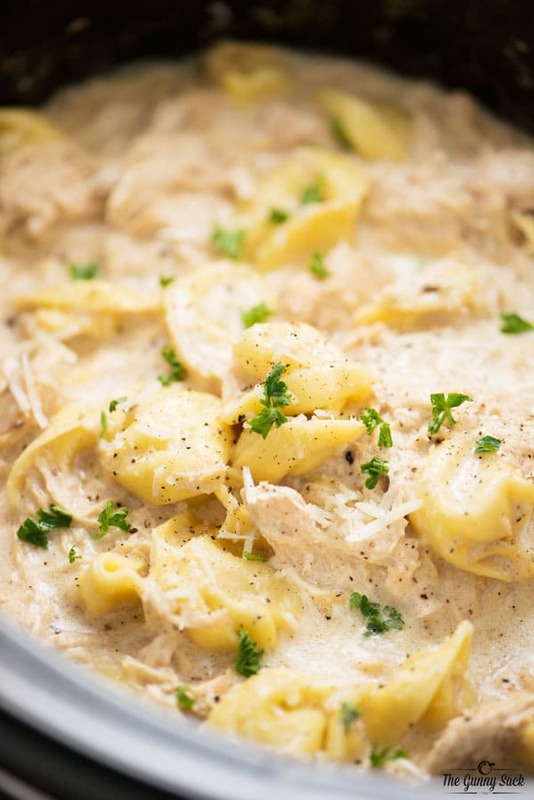 This Chicken Alfredo Pot Pie is perfect for a family dinner. It’s easy to make and you get your protein and veggies all in one dish. Cut the chicken into cubes. Heat oil in a pan over medium-high heat. Add the chicken and cook for 5-6 minutes. 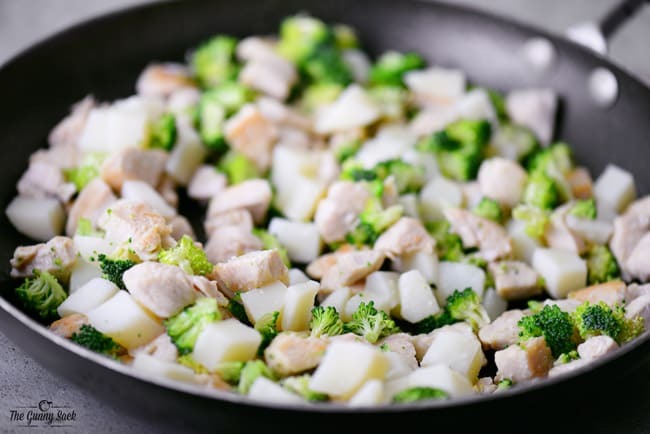 Add the diced potatoes and broccoli florets and cook for 4-6 minutes. Add heavy cream, shredded parmesan cheese, cream cheese, butter, minced garlic, black pepper and salt. Stir and cook over medium heat until the ingredients are combined and the cheese is melted. Cover with a sheet of thawed puff pastry and brush with a beaten egg. Place the pan on a rimmed cooking sheet to catch spills. Bake at 400 degrees for 25-30 minutes, until golden brown. My family has very sensitive tummies to dairy. 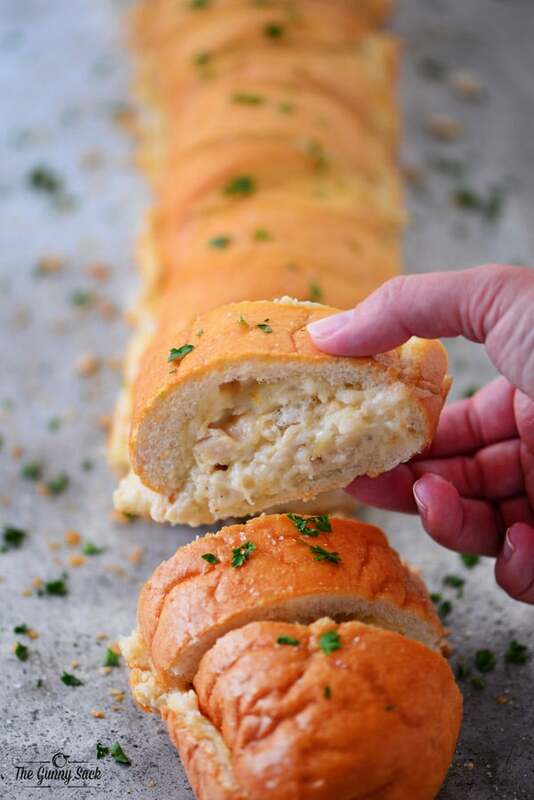 We love this recipe, for its yummy flavor – but can I sub anything for the butter, maybe and the heavy cream? Anything? 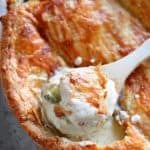 So yummy, this pot pie is superb! My family loved it. I added a little extra potatoe and broccoli and divided it into two 9 inch pie plates using 2 puff pasty sheets. This is going on to the dinner rotation for sure! I made Chicken alfredo pot pies for my friends, followed the recipe and was very happy with it. I served it in individual pumpkin bowls covered with the puff pastry. Not a crumb was left on the plates. I followed it up with Blooming baked apples. Best dinner party ever. You used pumpkin bowls.? As in individual sized hollowed out pumpkins?